The Orange marching season in the North of Ireland kicks off with Twelfth of July marches, preceded by the 11th night bonfires. This year the Twelfth demonstration passed almost without incident. The 11th night bonfires saw a rash of hijacking and petrol bombing in east Belfast and parts of County Down. These were protests following a court order applying fire safety rules to a bonfire. The Ulster Volunteer Force gangsters behind the hijacking believed as a matter of principle that the bonfires should be free of any legal impediment. They were a small minority. The unionist population were indifferent, the paramilitaries had been paid off and, for the first time ever, the Democratic Unionist Party stepped forward to demand obedience of the law. It has taken decades of conflict resolution and social engineering to get to this point. The Parades Commission, a government quango, has suspended the right to demonstrate for the whole population in order to engineer minor changes in Orange behaviour. The Commission is free to believe six impossible things before breakfast and to contradict itself at any time. No one demands a clear application of law. Alongside the Commission has gone massive grants to orange culture, the police constantly refusing to implement the law on the grounds that intimidation was a matter for community dialogue, collaboration by local government in organising the bonfires, and more recently a series of bribes and protocols which simultaneously paid the loyalists while allowing them to write the rules around what is at heart sectarian triumphalism. The icing on the cake was Taoiseach Varadkar endorsing the Orange Order and his declaration that the Irish state were “neighbours not invaders.” The final step to calm the Orange involved a series of royal visits, with Irish nationalism in general and Sinn Fein in particular bowing and scraping to confirm that any democratic content to the nationalist programme was a thing of the past. The policy has been a relative success and the response has been general relief. All are aware of the corruption behind the settlements but most feel is a price worth paying for a quiet life. Nationalist Ireland feel that this is a job well done. The Orange Order has finally been lulled to sleep. Any minor irritations, such as the constant sectarianism and racism accompanying the bonfires, can be ignored especially as the nationalist middle-class are largely unaffected. At one level of course the Twelfth was far from quiet. Young nationalists and republicans were involved in nights of rioting in Derry. The policy of enabling Orange bonfires and parades is less popular in Derry, especially when local youth know that there will a determined attempt by the state and the former republicans to suppress any nationalist demonstrations during the August commemoration of internment. When Sinn Fein lined up with the churches and the great and the good to condemn the riots and call on the police to suppress them, firework attacks were launched on the homes of Gerry Adams and leading republican Bobby Storey in Belfast. The pretence is that this is mindless violence, unconnected with Sinn Fein’s unrestricted endorsement of Orange reaction. Yet quite clearly Sinn Fein policy leads to the alienation of its base. At the moment that reaction is that of a minority and is wedded to militarism, but the emergence of a political challenge is inevitable. There is a downside. Sectarianism has been quieted by being accepted and codified. In the process the Protestant working class have been handed over to the control of the DUP and paramilitaries in loyalist areas. Victims of sectarianism are now defenceless. At every instance of sectarian intimidation the police will shrug their shoulders and point to the protocols in place. The bonfires will remain an ongoing focus of sectarian and racist intimidation bedecked with flags and effigies of their enemies to be burnt in the fire. 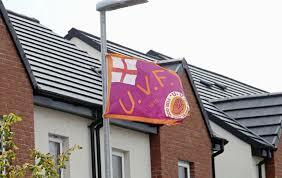 Paramilitaries can hide behind the fiction of legal flags to continue intimidation and to force people from their homes. It is significant that Cantrell Close, designed as an area of shared housing between Catholic and Protestant to demonstrate the non-sectarian future guaranteed by the Good Friday Agreement, has now been ceded to the control of the loyalist paramilitaries. The state and Sinn Fein so openly endorse housing apartheid that it causes no upset. Behind the corruption lies deep complacency. The nationalists are convinced that demographic changes will give them in the majority in the area and lead to United Ireland. Yet the Good Friday Agreement, British policy, the acceptance of Orange culture and of sectarian division as well as the class interest of the nationalist middle-class and Dublin capital are building a sectarian stasis that will be hard to change. This stasis will eventually collapse. The only alternative open is the alternative of workers unity and the workers Republic. It is this alternative which has been suppressed by identity politics and cultural equivalence in the new sectarian state.